This recipe is great, because there are so many ways you can change it up to fit whatever you have in your pantry and fridge! Here is the original version using Indian Woman beans (I know, I had never heard of them either), and the toppings. Then $5 Dollar Dinners posted her version here, which is more closely what I followed. The common thread in the three of ours is the way the corn is cooked! So yummy to be sauteed with garlic and green onions, I love it on the grill too, so you could do it that way and it woulod still be great. This pic is a little blurry, couldn’t get one in focus for some reason. Cook brown rice according to package instructions. You could even use a red beans and rice type of packet. In a skillet, add olive oil and lemon juice, then crushed garlic, sliced green part of the green onions, and the kernals from the corn cob. (Cut off from the cob!). Saute over medium high heat for 7-10 minutes, or until corn browns. Dice tomatoes from the garden. 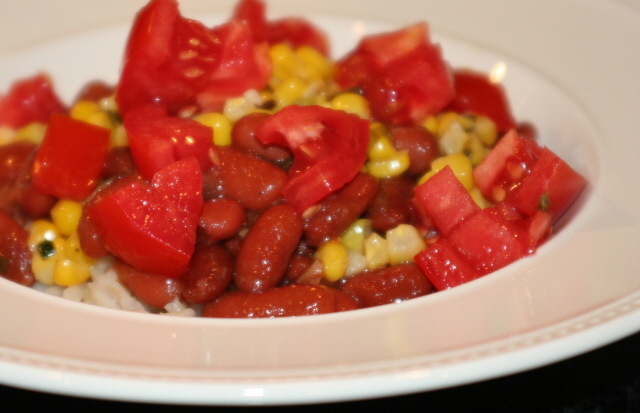 Serve Red Beans over Brown Rice, Topped with Pan Roasted Corn and Tomatoes…and Chips and Salsa! 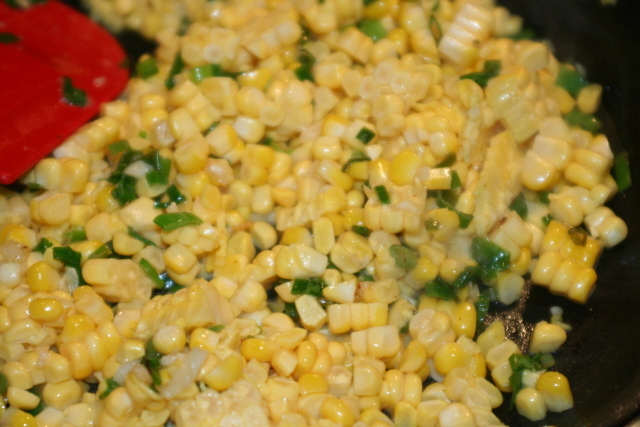 Sauted olive oil, lemon juice, crushed garlic, sliced green onions, and the corn kernals.